Bedroom Aids for the hospital or the home. Scroll down to see our selection of Bedroom Aids for sale. Bedroom aids are an important part of the daily care of patients and loved ones. We carry a large selection of different bedroom aids. Bedside tables, overlays, safety bedrails, specialty pillows and positioning cushions are just some of the many bedroom aids you will find. 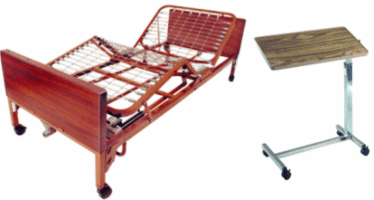 Bedroom aids are products that assist the elderly or disabled with simple everyday tasks. Disabled or elderly patients spend the majority of their day in the bedroom. Hospital bedroom aids can relief the stain on care givers and reduce injury for them and the patient. Home bedroom aids return independence to those with limited mobility. No matter what your needs maybe, the right bedroom aid can help simplify your daily life..